Kendal at Oberlin residents with mild to moderate cognitive changes will soon have a new place to call home, located just down the hallway from their current residence. Also like any home, many personal touches will be added by the new residents, who begin moving in early this year. The bare walls will be decorated with artwork from their collections, their bedrooms furnished with their favorite items, daily activities planned around things they enjoying doing. “When we designed the space and the programs, we wanted it to be as flexible as possible to reflect the residents’ interests,” says Kim Preston, social services associate. 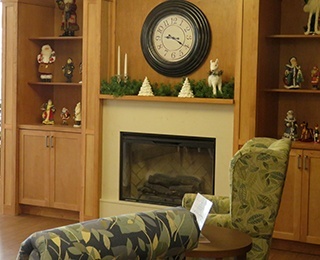 Life Enrichment Coordinator Amanda Hooley has lots of ideas, from offering poetry readings and trivia games to Tai chi and watercolor classes and baking cookies, but it will depend on the interests of residents. “I love how Kendal’s philosophy of ‘Together, transforming the experience of aging®’ encourages the Jameson House to support each resident in living their most resilient life,” she says. The house also has many special designs that offer comfort, safety, creativity and curiosity for people with dementia and other memory challenges. Residents can safely walk anywhere inside and out because the house is laid out along an enclosed circular path with an outdoor courtyard in the middle. The courtyard will have a sensory garden, featuring a water fountain, herb garden, and dining area. Plants include a “purposeful fern” that will shed on the floor and might provide an enjoyable task for a resident. Doing laundry and folding linens in a large, well-lit laundry room might be another such task. Visitors will ring a bell before entering Jameson House, and staff will be silently alerted when a resident who needs assistance leaves Jameson. Each resident will have a personal “life book” with photographs, biographical information, and memories that can be shared with other residents, staff and volunteers. The resident and family members will help compile the book. Each resident will also make a personalized clay leaf to decorate a legacy tree wall decal. “The ache for home lives in all of us. The safe place where we can go as we are and not be questioned” is a quote from Maya Angelou and one of several placards displayed during an open house held in mid-December. “It’s beautiful,” says board member Dave Clash, adding, “I watched it grow from the ground up.” Dave chaired the master planning committee where the concept for a memory support home was first discussed. The house is a combination of renovated space and new construction, about 19,000 square feet in all. Up to 12 people can live in Jameson. 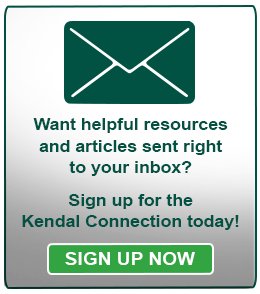 Kendal residents have priority, but direct admissions will be offered if space is available. 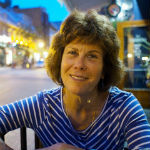 The light, both natural and artificial, is what struck Anne Helm when she walked in the door. “I have seasonal affective disorder (SAD) and need daytime light. It lifted my spirits to see all that light on this gray day,” she says. In conversations with potential residents and their family members, Kim Preston says there is excitement about the house, especially the Great Room and dining area, which has been designed to be the hub for resident gatherings and activities. “The key thing is just giving the support that is needed, so residents can be active and socialize and live the lives they want to live,” she says.